One of the really scummy things to come out of the Great Recession were the predatory real estate scammers who crawled out of the woodwork to promise families they’d help save their houses, only to actually take their money. It turns out Mr. “Taco Trucks On Every Corner” Latinos for Trump founder Marco Gutierrez was one of those. Here is his LinkedIn profile, screencapped here for posterity. According to HERA, a non-profit state organization which helps people with housing issues, Gutierrez is a serial scammer. In their 2013-2014 Annual Report, they describe their own dealings with him, when his abuses of immigrants and their loan modifications came to light. Abuses leveled at immigrants can be particularly vicious. As part of a foreclosure rescue scam, Marco Gutierrez bullied and intimidated HERA’s monolingual Spanish-Speaking homeowner client, charging over $16,000 for a loan modification. He took the homeowner’s car as partial payment but never changed registration, racking up unpaid tickets under the homeowner’s name. When HERA helped the homeowner complain to authorities, the scammer filed a meritless lawsuit against the homeowner (and against a HERA staffer). In the course of defending the case, HERA discovered that Gutierrez was a serial litigant who had filed dozens of actions against his “clients”. Gutierrez was using the court system to bully vulnerable residents across several counties into paying amounts they did not owe him and to retaliate against those who complained about his practices. After defeating Gutierrez’s claims HERA brought a successful vexatious litigant motion against Gutierrez. As a result, both HERA’s client and countless other unrepresented homeowners who might have fallen prey to Gutierrez’s tactics are now protected. 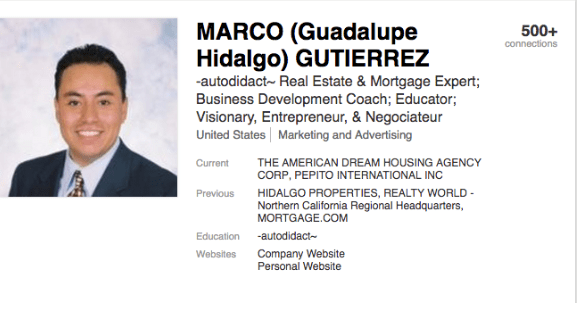 The California Department of Real Estate has also brought actions against Gutierrez. In a 2011 action, they sought to revoke and/or suspend Gutierrez’ license for collecting advance fees for a home retention action, only to take additional funds from the homeowner’s checking account to pay his Comcast and Sprint bills instead of helping them to keep their home. Quite frankly all of you liberal scum are a disgrace! I remember everything about the housing crisis. Also I have a family member that did loan modifications. If something went wrong do to the clients own record the modifier was ripped to shreds do to the home owners anger over losing their homes. A lot of people lost in the housing crisis including Realtors. Bankruptcy is no big deal. How can you rest at night knowing that you deliberately tried destroying a Family? That’s right, you’re a Hillary supporter and we all know her supporters have no Shame!